◉ Record, Edit and Convert Audio with Vector. 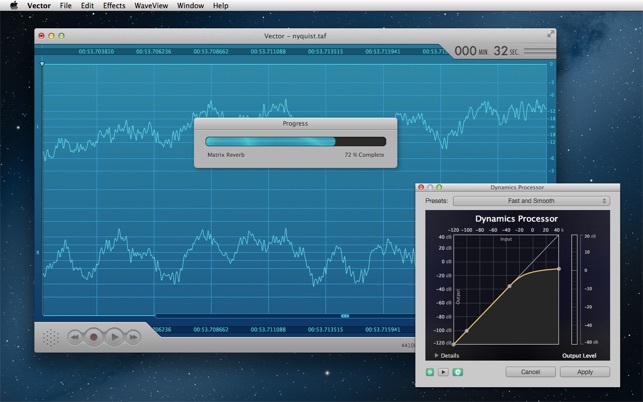 Vector is the swiss army knife of digital audio. Record audio, edit existing audio files, convert your music between the most common audio file formats, digitize your old vinyl records or record internet radio stations*. Whatever you need to get done - if it has something to do with audio Vector is your best bet! ◉ Version 3 - better than ever! 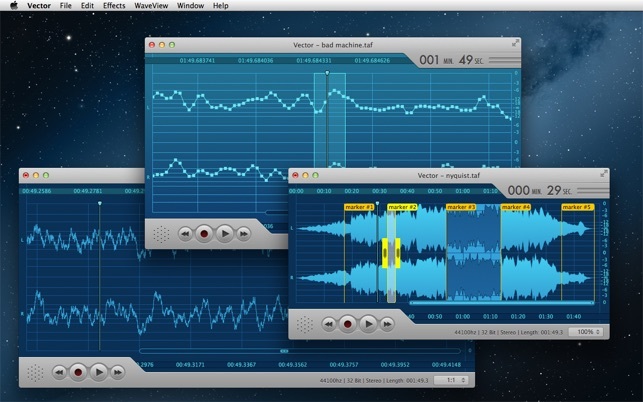 Vector 3 is the next generation of our popular audio editing and recording app for the Mac. We rewrote the app completely from scratch and added many new features for version 3.0. Vector is now a full blown audio editor that offers professional features and yet is still easy to use! • Cut, Copy and Paste between multiple documents. • Delete and Trim audio. • Infinite and instantaneous Undo and Redo. • Undo and Redo states are saved with the document. 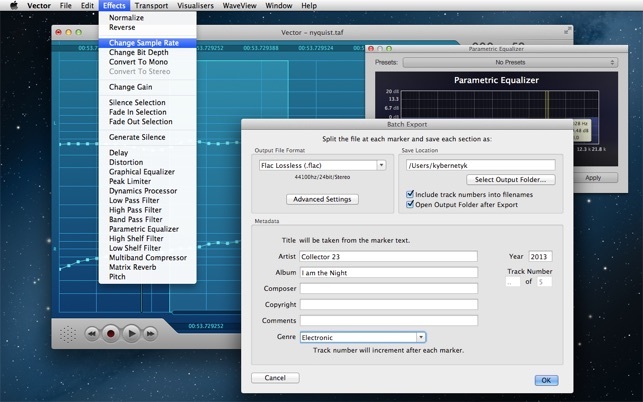 • Supports importing of multiple audio files into one document. • Supports full screen editing. • Supports Stereo and Mono audio. • Supports sampling rates 8khz - 384khz. • Supports bit depths 8bit, 16bit, 24bit, 32bit. • Supports conversion between all channel layouts, samples rates and bit depths. 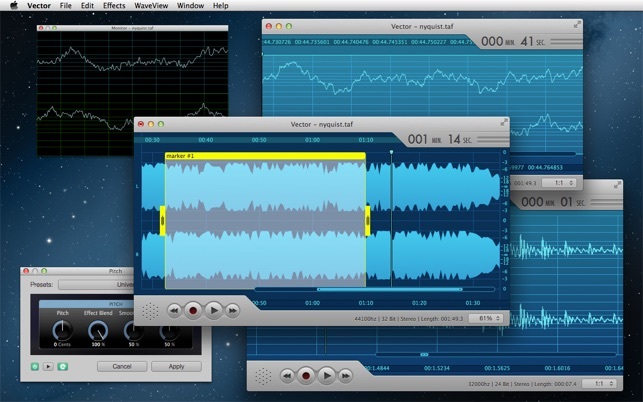 • Waveform zoom levels from 100% down to 1:1 sample resolution. • Supports editing of individual samples. • Supports recording from built in microphone and line-in. • Supports recording from any USB and FireWire Audio Device that is supported by OS X. • Maximum recording length is only limited by free space on the hard drive. • Also supports 3rd party Audio Unit plugins. 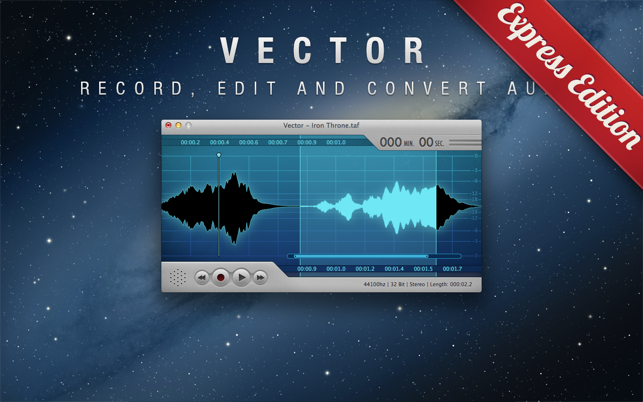 Get Vector 3 now and solve all your audio needs! * Please note that recording audio from the internet or other applications requires installation of the free 'Soundflower' driver - which doesn't take longer than 5 minutes. Detailed instructions can be found in the included manual. PLEASE NOTE: This is the "express" version of Vector 3. In this version you cannot save audio files longer than 10 seconds. Everything else is exactly the same as in the full version of Vector 3. 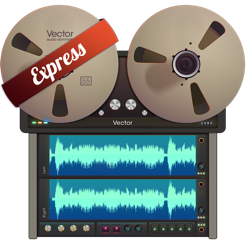 Use this version to test-drive Vector 3 before buying the Full Version or as a means to edit and play back native Vector 3 documents someone sent you. - Added a new color scheme that does away with the default red hue: "Vector 2 Color Scheme"
Why don’t you just say trial instead of Lite. Lame!